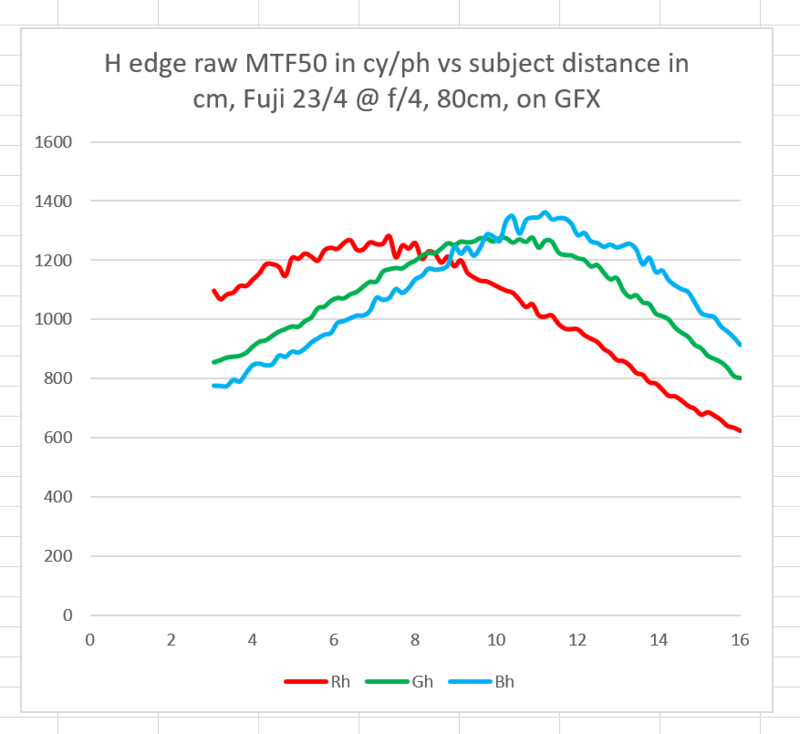 This is the 63rd in a series of posts on the Fujifilm GFX-50S. The series starts here. I measure focus shift and longitudinal chromatic aberration (LoCA) in lenses in the following way. I mount the camera to a Cognisys computer-driven focusing rail. I set the controller up to use 160 mm of travel and make 101 exposures 1.6 mm apart. I set the assembly a distance from the target so that 160 mm of travel gives me both sides of the peak sharpness with some room to spare and make a set of images at each whole f-stop in the range of interest. I use Adobe DNG converter and dcraw to get the mosaiced raw images. 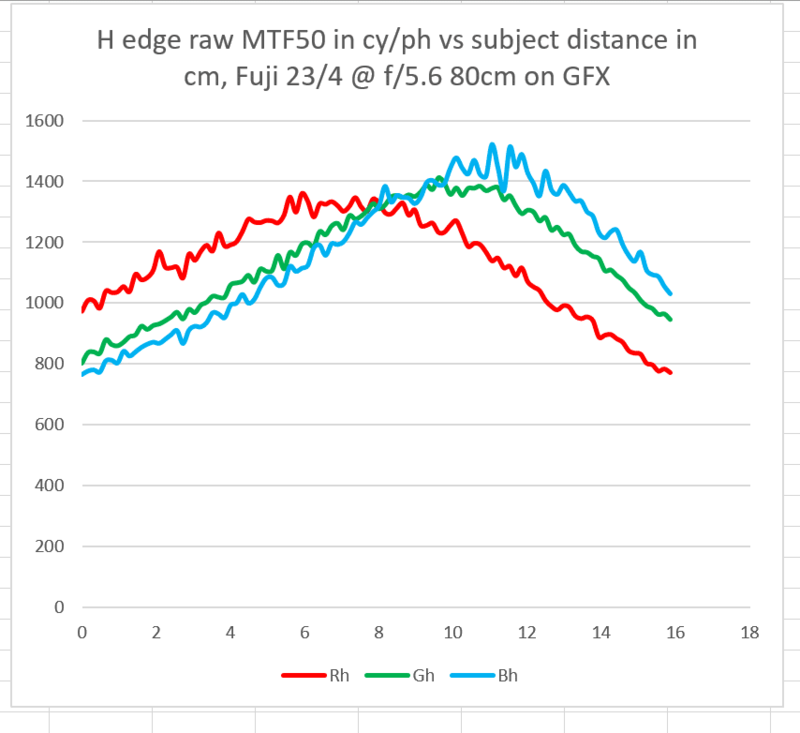 Using a Matlab program that I have modified greatly from one that Jack Hogan wrote, I call MTF Mapper to find the MTF50 for a horizontal slanted edge, and plot the results in cycles per picture height vs distance from the point furthest away from the target. Wescott LED panels set to 5500 K.
Target distance at the center of the rial, 80 cm. I would have liked to have been further away, but with a lens this short and rail travel limited, this is about the best I could do. I used a low-contrast slanted edge target printed with an inkjet printer on semi-gloss paper. It’s not as sharp as the razor blade that I usually use, but I needed to use a target bigger than the razor blade at more usual subject distances, and don’t want to make things confusing by having more than one target for the same lens tests. Because I’m using a low-contrast, not-wonderfully-sharp target, and I am so close to it, you can’t compare the numbers here with the numbers that I showed you in the tests of the 120 macro and the 63/2.8. The 23 is a very sharp lens, even if these numbers aren’t that impressive. 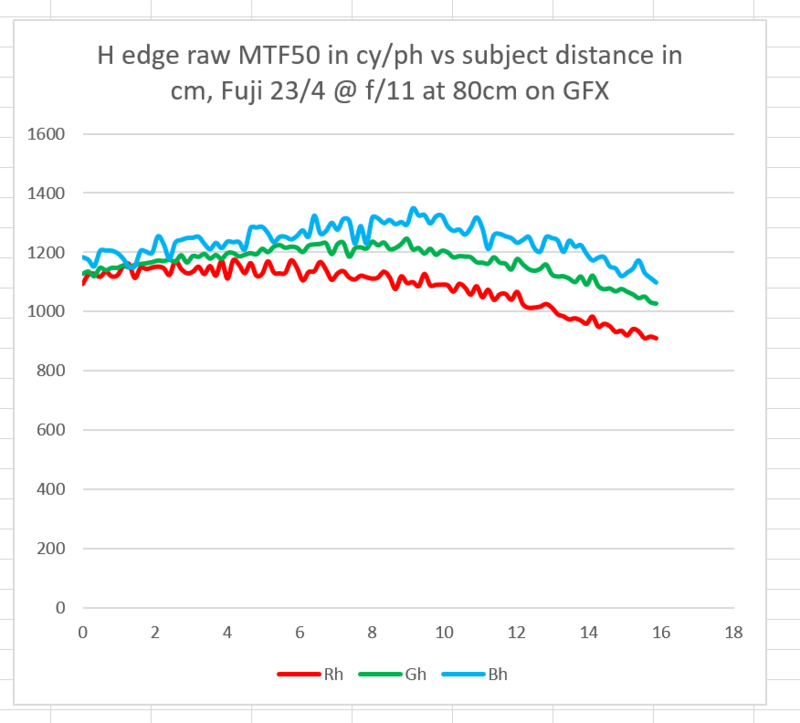 The horizontal axis is relative subject distance in cm. Far distances are on the left, and close ones on the right. 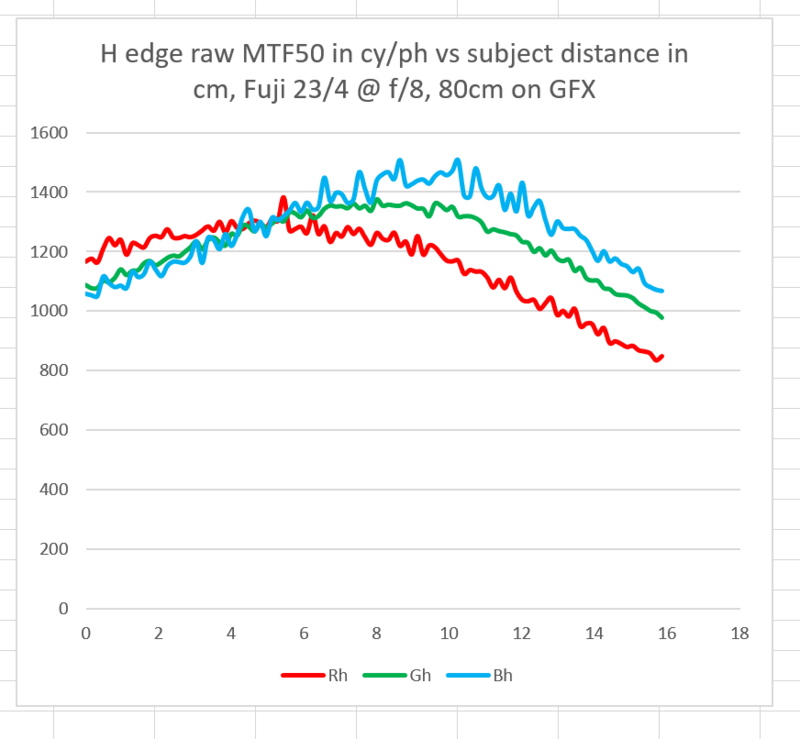 The vertical axis is MTF50 in cycles/picture height. You can see that maximum sharpness — the highest point on the curve — is not obtained at the same subject distance for all three planes. That’s LoCA. I did not smooth the curves. 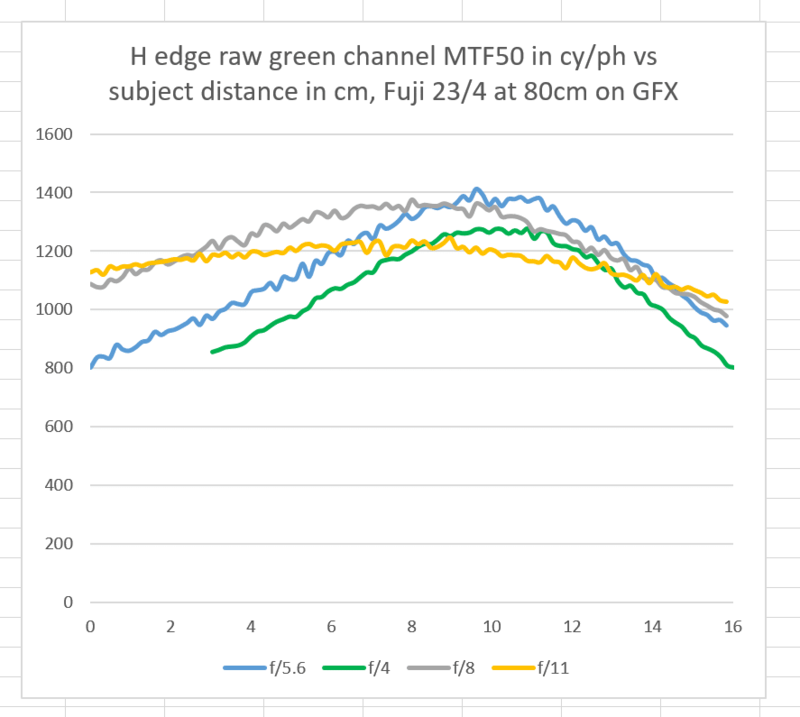 With one exception, which I’ll get to at the end of this post, you are looking at plots of the data just as they came out of MTF Mapper. At f/5.6, the depth of field (DOF) is not enough to cover up the LoCA. At f/8, the LoCA is going to be mostly masked by the DOF. At f/11, you’re not going to see any LoCA. It’s not bad at all. You’ll be perfectly fine focusing this lens wide open and saving yourself a button push on the GFX. Now is when it gets ugly. What’s that jump in the middle? The lens shifted focus, even though no one was touching the camera or the lens. It moved the focus back (further away from the camera) 19 steps. I repositioned the earliest data and dropped the duplicates. This is not the first time I have seen the Fuji GFX focus by wire lenses spontaneously change where they are focused with no provocation. It is not something a tester likes to see. It is also not something a photographer likes to see. I hope that Fuji fixes this. Interesting Jim. 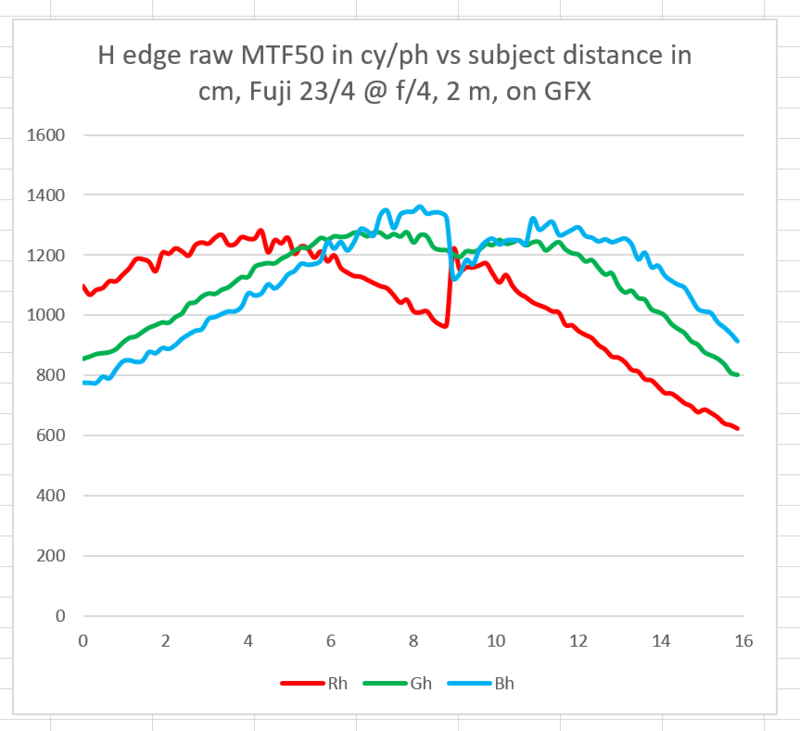 Do you think that the heavy rippling in MTF50 results is also due to the focus-by-wire setup? I don’t think so, Jack. It it were so, then the three raw channels would be strongly correlated. Jack, I’ve just compiled the data for the 110/2, where I could use the razor blade target, and it is very smooth and there is little noise. I think the low-contrast target is what is causing the noise in these curves. Hi Jim, a off-topic question: does your blog provide rss subscription? Yes, it does. You can use any RSS feed reader. I’m just using the out-of-the-box WordPress features, though. There used to be a WordPress-standard RSS widget that you could add to sidebars, but that’s no longer available. There are other ways to do that, but I haven’t gotten around to implementing — or even understanding — any of them.